CEBIB student to further her MSc. research studies at Ecole Polytechnique Fédérale de Lausanne, Switzerland. Ms. Towett Sharon a CEBIB MSc. Biotechnology student invited to Prof. Bruno Lemaitre Laboratory - UPLEM at Ecole Polytechnique Fédérale de Lausanne, Switzerland from February 1, 2016 to April 31, 2016 to co-work on a project involving Drosophila-Spiroplasma interaction. 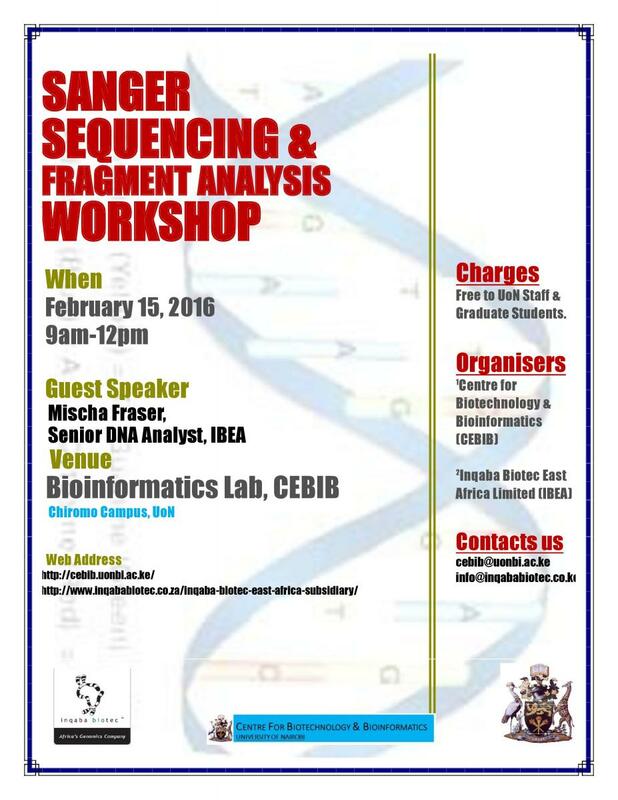 SANGER SEQUENCING AND FRAGMENT ANALYSIS WORKSHOP-CEBIB in collaboration with IBEA Ltd.
CEBIB in collaboration with Inqaba Biotec East Africa Ltd have organised a half-day workshop to be held in CEBIB Bioinformatics Lab on Monday February 15, 2016 at 0830 – 1200 Hours. The objective of the workshop is to equip participant especially graduate students and early career researchers with DNA Analysis skills. The workshop will focus on Sanger sequencing technique, fragment analysis, CLC Bio and Animal genetics. The guest speaker will be Mischa Fraser, Senior DNA Analyst at Inqaba Biotec East Africa Ltd.
R PROGRAMMING FOR BEGINNERS WORKSHOP AT CEBIB - FRIDAY, FEBRUARY 12, 2016. This workshop is meant to introduce R programming for data analysis to graduate students and early career scientists. The course is open to all, but due to limited capacity of the training venue; only the first 35 applicants will be selected. Applications will we processed on a rolling basis. Deadline for submission of Application is Wednesday, February 10, 2016, 2100Hrs. After completing my Diploma in Biochemistry from Technical University of Kenya, I applied and was accepted into the Centre for Biotechnology and Bioinformatics (CEBIB) 3-months internship programme. PHOTO: Mr.shivachi viewing PCR Products in gel documentation system after electrophoresis. In the multiple facets of being a proficient laboratory technologist and a researcher, I have objectively developed interest in shaping my career founded on accuracy, quality and reliable performance in delivery and pursuit of problem solving information. These are intangible and timeless concepts that cannot be taught in a lecture room; it requires real world experience. Some of the techniques I have mastered during my internship; Sample collection, aseptic techniques, culture media preparation, culturing micro-organism & isolation, preservation, extraction of nucleic acid and amplification (PCR), spectrophotometry, proteins electrophoresis (SDS-PAGE&NATIVE PAGE), amongst other techniques. e broaden my technical skills and critical thinking in Biotechnology and Biochemistry. I also loved the people I worked with and interacted with each day. The approachable personnel at the Centre have been available for consultation when I needed their support. Mr. Willingtone Odhiambo gives a presentation at a workshop held on October 27, 2015 at the Nairobi Surgical Centre, Chiromo Campus. Mr. Odhiambo, holding linear cutter staplers used for bowel resection, and anastomoses, explains to the participants how medical devices interact with the living tissues during surgery. Medical devices featured include sutures, titanium staples, implants and energy platforms such as ultrasonic machines, diathermy amongst others. The workshop theme was ‘Science of Tissue Management during Surgery’. It was organised by Johnson and Johnson Professional Educational. The event targeted consultant general surgeons from Kisumu, Eldoret, Mombasa and Nairobi. The workshop was facilitated to encourage the adoption of technology during surgery and improvement of patient health. High Performance Liquid Chromatography Antibiotic Residue Analysis in Kidney, Liver and Edible Meat Tissues. The administration of antibiotics orally or by injection for either prophylaxis or cures or both has facilitated successful management of bacterial infections. The efficacy of these diagnosis is dependent on judicious and appropriate administration otherwise may be residual in milk, meat and other edible animal products. Compliance to the maximum residue limits (MRLs) set by the World Health Organization (WHO) and the Food and Drug Administration (FDA) is crucial to avoid recurrent cases of multidrug resistance as well as allergic reactions in sensitive individuals.